High-Tech Threads: Can Your Clothes Do This? Today’s clothing isn’t just about fashion — it’s about function. We’re not talking about Scottevest’s Inspector Gadget-esque trenchcoat to store your iPhone, iPad, iPod and even a few changes of clothes. Sure, that’s handy, but the jacket itself isn’t high-tech (though it is well designed). Mashable has explored that ways in which tech companies and fashion brands have coming together to prototype new kinds of apparel, and we spoke with independent designers who’ve concepted mind-blowing gear that essentially transforms your body into a generator. 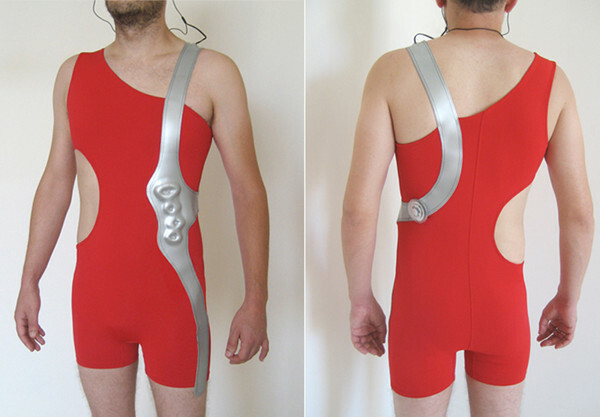 This clothing doesn’t just hang on your body — it does something. From saving your life to charging your gadgets, this wave of innovative fashion makes city living safer and a bit more convenient. After all, there’s no need to stop in a Apple store to charge your phone if your shirt can do it on the go, right? What innovative apparel would you like to see in the future? Let us know in the comments below. When you go for a run, you’re not just burning energy, you’re creating it, too. And the production of kinetic energy is exactly what fuels the mp3 player that’s embedded into designer Rafael Rozenkranz’s high-tech jogging suit (see below). “The project was conceived because I jog almost everyday, and I like to listen to music doing so — but there were always problems,” says Rozenkranz, adding that he was annoying by the device’s placement on the body and battery issues. The use of kinetic energy isn’t new — but the fact that it can keep your tunes bumping is, and it promises a future of cool gadget integrations in fashion. Hitting the beach instead of the running path? You can stay charged with a solar-powered bikini, developed by Andrew Schneider, a New York designer. It’s a regular bikini that’s retrofitted with 1″-thick photovoltaic film strips, whose generated power funnels into in a 5-volt regulator and then a female USB connection, so it can charge a device. The male version, the iDrink, is coming soon — and with more surface area than a bikini, it’ll generate more energy. Back in 2010, British mobile carrier Orange partnered with GotWind to develop rain boots that charge your phone at the oft-muddy Glastonbury Music Festival. In 2011, Orange upped its game with a sound-charging tee. Orange has no plans to bring any of these items to market — the pieces are “very much billed as prototypes” and only one or two produced, says Alex Wilkinson, a spokesperson for the company. The samples are used primarily to highlight the kinds of technology that could be used in a mobile charging solution, and are “meant to generate debate and discussion, rather than be consumer-ready products,” he added. And since the Glastonbury festival is taking this year off, we won’t be seeing a new prototype for this year’s event — we’re already looking forward to 2013. Another useful apparel feature? Night lights. 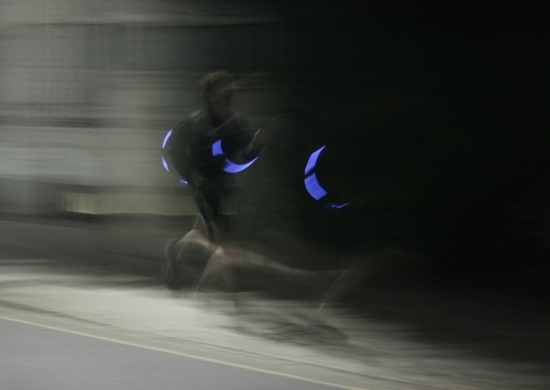 British design student Nick Reddall developed a jogging jacket that generates electricity during a run. That current is used to fuel lights on the back and sleeves of the jacket, which help keep night runners safe. “Maybe people go running in the evening,” Reddall said at a London art show. “This can therefore keep them safe when they’re exercising.” While this technology isn’t necessary — why not just slap on some reflective strips? — the science has cool applications that we look forward to. 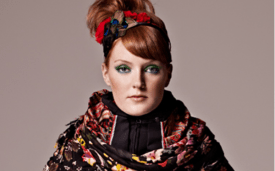 Leave it to the Scandinavians to come up with an “airbag” that looks like a fashionable scarf, right until it’s deployed. Hövding is a collar for bicyclists that’s worn around the neck and contains a folded-up airbag that deploys in .01 seconds. Sensors embedded in the collar track the cyclist’s movements and will trigger deployment when an irregular motion is picked up, such as a swerve or a bump. The airbag is shaped like a hood, thus protecting the bicyclist’s head and neck, and is inflated by a gas inflator — one of the smallest on the market — in the collar. Once it inflates (and it does fully inflate before impact), the airbag provides shock absorption and a steady air pressure, then slowly starts to deflate. Like on a plane, there’s even a black box that records a bicyclist’s patterns in the ten seconds before an accident — Hövding uses this data to improve upon the design. The company also extracts data from staged accidents, whether with crash test dummies or stunt cyclists, and adds this information to the database so that the Hövding’s “brain” is more attuned to abnormal motions. The project started as an industrial design master thesis by Terese Alstin and Anna Haupt in 2005. The Swedish government had just passed a law to make bike helmets compulsory for children up to the age of 15, triggering a debate over whether helmets should be compulsory for adults, too. “To us, who wouldn’t be seen dead in a polystyrene helmet, the thought of being forced to wear one by law was cause for concern,” says Alstin. “We realized that our master thesis was the perfect place to find out whether the traditional bicycle helmet could be improved on.” Market surveys indicated that people wanted a discrete, “invisible” helmet that wouldn’t ruin their hair or cramp their personal style. And so, “Hövding allows people to protect their heads on the road, without sacrificing style — or the hairdo — in the process,” Alstin adds. Even though it only clocks in at a few pounds, the weight of a laptop can wear on you. That’s why Alphyn Industries came out with the PADX-1 Ledge Wearcom. 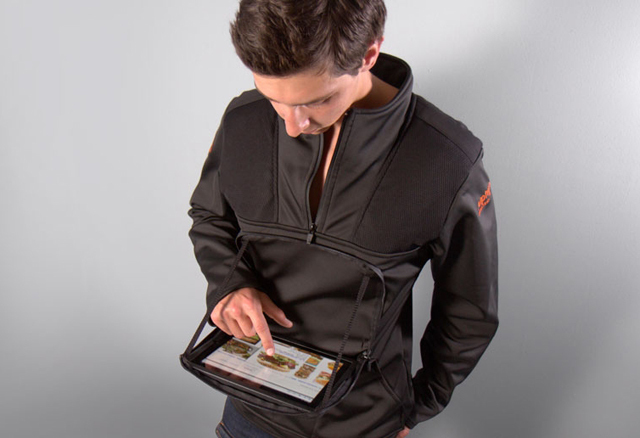 It’s a pullover with a kangaroo pouch that stores your iPad or computer when it’s zipped, and serves as a “shelf” when it’s unzipped. The pullover distributes the device’s weight throughout the straps so that you don’t wear carry the weight on one side, which could lead to back pain. Considering it’s a portable workspace (the shelf leaves both hands free), the $285 asking price isn’t too bad.